A kitchen can easily be referred to as the heart of a house, where conversations boil over food and where delicious things are whipped up, making it a space that requires immense attention. It could be the one place in the house that is used to exhaustion and so after a while many features start give away the age of the kitchen. But the good part is that they are often simple features that can be easily updated to give the kitchen the must deserved face lift. With the addition of just some new features you can transform that old-looking kitchen into a modern one, that too without spending a whole lot of money. If you wish to re do your kitchen then do consider these eight helpful decorating tips that will help you glide through the process without any hassle. One of the features that gives away the poor condition of the kitchen is the hardware on the cabinets. If the first thing you notice when stepping into a kitchen are the ghastly hardware, then you can be sure that your kitchen needs a make over. You can’t just change the ones on a couple of cabinets and leave it there, but have to do so for the entire kitchen. So price becomes an issue. But that said, you need not go for the extremely expensive ones. There are so many varieties in the market to suit every budget buyer. So select one that works well with your cabinets and give your kitchen the instant uplift it deserves. A kitchen with good cabinetry will make a whole lot of difference to the entire outlook. One of the latest in kitchen trends is the open cabinetry with stylish storage baskets instead of the age old cabinet doors. Remove the boring wooden cabinets and replace them with rustic baskets which will serve the purpose, but with a higher edge to it. They can easily hold pot holders, plates and saucers, glasses and kitchen gadgets, and everything in between. Carefully remove the doors from the cabinets and then fill the holes with wood putty and then sand it properly once it dries. Then cover the filler with a stain that matches, which will make all the difference. If you can get the exact color, the holes would not be obvious making it look like the cabinets never had doors in the first place. If that proves to be too much work, then use decorative pieces of wood to cover the holes left by the missing door. You can just glue them on with wood glue and you can select from a range of patterns and colors to suit your needs. This may not be the cheapest option, but definitely the easiest. It is a known fact that a fresh coat of paint will make anything look as good as new. So along with changing your hardware and replacing the cabinets, give your kitchen wall a new touch of paint as well. It is in fact one of the best ways to attain the refurbished look when you are working on a budget. Get rid of the common olive green or 70’s gold and go creative with a trendy new color. To get more ideas, head to the nearest hardware store and view your options before deciding. Get some samples from the store and place it next to the cabinetry and flooring to get an idea of how it would look at the end. Also see how the appearances are at different levels of lighting and at different times of the day as well. Remember, once you have decided on the color and painted the walls, there is no going back. So think and act. Beautiful rugs and window treatments add great texture to the kitchen and can bring back the much deserved life a kitchen needs. Durable throw rugs can work, especially if your flooring is a bit worn out and your current budget doesn’t allow a floor replacement. Rugs are much cheaper and much trendier and if they become dirty you can just throw them in the machine and wash them clean, not to mention how comfortable it would be to stand on it with your bare foot. Have a rubber backing to keep the rugs in place and you will have a brand new kitchen floor. Lighting in a kitchen needs to be right and most often than not, it is one of the main giveaways of a worn out kitchen. Get rid of the outdated lighting and replace it with under cabinet lighting and overhead track lighting. There are many styles you can opt for with track lighting, and under cabinet lighting just helps you in leaps and bounds when you are cooking. However, head to a lighting store and gather your options before investing in them. Another simple way to enhance the look of your kitchen, without any professional help, is to add a new wall decor. Scout around the internet and charity shops to get some contemporary wall art- metal, canvas, or wooden- and place them where they would look the best. You can then surround the art with smaller works of art, wall planters, or candle wall sconces and make it look even better. Mixing and matching is what you need to do here and the options are endless. Faucets are by no means cheap, but getting the perfect ones makes all the difference. If your sink is in great condition but your faucet isn’t, then just make arrangements to change the faucet alone. Head to a home improvement store and check out the wide variety of styles available. Since you are anyway replacing it, get one with an oversized goose neck faucet, which comes with a sprayer and soap dispenser and get the help of a professional to fix it for you. Make use of a bare space on a wall or between the cabinets by including some painted shelving. 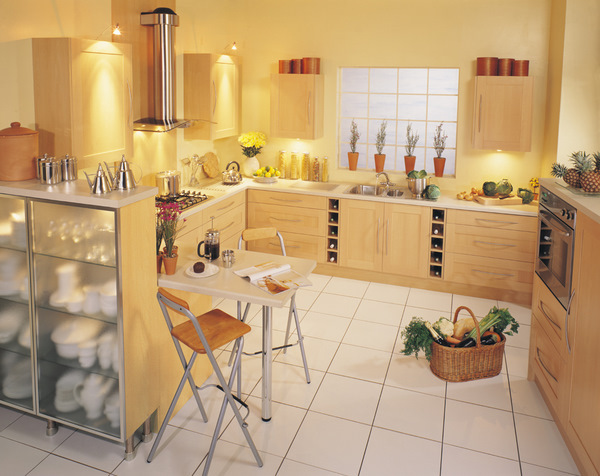 They not only work as great storage spaces, but also uplift the look of the kitchen. Get stylish brackets for the shelves and you can then store jars of spice, colorful ceramic dishes, kitchen potpourri, or anything that is visually appealing. If you would rather use it as a book shelf, go ahead and fill them with as many cook books as you prefer.